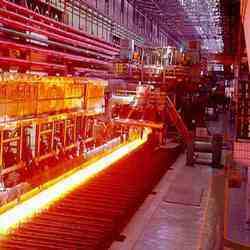 We have started a modern steel rolling mill, with a production Capacity of 1200 M.Tons/P.M. with this we have planned to diversify our business into industrial oriented one. We are amongst the most reputed names in the industry, offering Steel Rolling Mill Machine. We have been highly acclaimed for the exhaustive range of Steel Rolling Mills Machines that we offer. Peripheral Speed Pinch Roll before TMT Line : 2 to 18 m/sec. Pinch Roll after TMT Line : 2 to 18 m/sec. We provide complete Steel rolling mill machine parts as per customer’s requirement on turnkey basis. The sturdy construct machinery is specially used for cutting, reducing and grinding the particles of different types of grains. We also offer customization on our range as per the specification of clients. 4 HI Rolling Mill Machine. 4 HI Cold Rolling Mill Machine. 4 HI Cold Rolling Machine.